There have been many claims made as to the health benefits of extra virgin olive oil – While a few are well reasoned, many are over the top. Statements like “this study proves that EVOO consumption cures this cancer or that cancer” aren’t uncommon. However, these Chuck Norris type claims are usually based on a single study involving cell lines propogated in test tubes and then subjected to various olive oil components of unknown bioavailabity at hundreds or thousands of times the concentrations naturally found in EVOO. Clearly, while these in vitro studies provide a good starting point for further research ‘in the field’, they, by themselves are too far removed from reality to justify the definitive claims that often follow their publication. Extra Virgin olive oil is distinguished from all other oils in that it is richly endowed with a unique combination of monounsaturated fats, polyphenols and phytosterols. – lower levels of “bad cholesterol” (LDL) and higher levels of “good cholesterol” (HDL). – lower levels of heart-unfriendly oxidised LDL’s. – reduced DNA oxidative damage which in turn is related to a reduced risk of some cancers. – reduced incidence of hypertension. – improved glycemic control, which is particularly advantageous to diabetic patients. Agreed, the wording is measured, which may not suit everyones marketing style when it comes to explaining the health benefits of their EVOO. But hopefully this may give some direction on how to reasonably spruik the benefits of eating extra virgin olive oil. Around 7 years ago I was reacquainted with a small olive oil producer from Western Australia. It was a chance meeting – I was staying at a hotel attending a wine conference and he was on holidays with his family. After some chat, Colin went down to his car and generously gifted me a bottle of his new season olive oil. I forensically began to scan the labels for the nitty gritties (as I do!). Variety Pendolino – check, oleic acid level in the high 70’s-good, nope, no free fatty acid level (why tfn I thought?). But much to my surprise, hand written on the back label was the amount of polyphenols the oil – around 550 mg per kilogram if I recall correctly. Now that’s a fair slab of polyphenols which was no doubt why he put it on the label. Polyphenols are naturally occurring antioxidants. They are found in extra virgin olive oil in the range of about 100 to 1000 mg/kg (0.1 to 1 gram per litre) with an average of around 250-300 mg/kg (when measured in caffeic acid equivalents – more on this later). No other edible fat contains significant levels of polyphenols (virgin coconut oil is the closest at a paltry 50 mg/kg or less). While as a group they are widely believed to confer health benefits, they are also solely responsible for the bitterness and pepperyness of extra virgin olive oil. At over half a gram per litre, Colin’s oil did in fact prove to be a robust extra virgin olive oil. 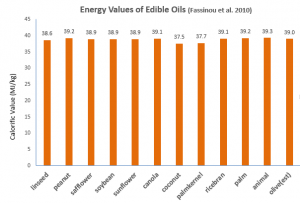 On top of this, polyphenols are one of the things that positively contribute to the shelf life of the oil. So if they are important to healthfulness and oil stability why don’t more EVOO labels contain this information? Well one can only speculate, but it possibly due to a few reasons The first is the most likely – I’d guess that some producers don’t know of their existence and/or importance to healthfulness. Secondly, the official polyphenol assay is rather expensive as it is labour intensive and uses expensive reagents. Unlike many of the other basic oil chemistry that doesn’t change much if the olives are grown in the same place and the oil made in the same way, the polyphenol level can vary substantially depending on growing season, crop load and particularly on fruit ripeness at harvest. Therefore polyphenol levels need to be measured each year. A one size fits all approach doesn’t work for polyphenols. When Colin gave me a bottle of his oil I can only say one thing with certainty – it didn’t contain the full quota of 550mg/kg of polyphenols as stated on the label. Not that he was cheating. Polyphenols decline from the moment the oil is extracted from the olive. Many are powerful antioxidants, so by definition they sacrifice themselves in the process of mopping up the rancidity causing free radicals generated from oxygen. But how quickly can polyphenols be chewed up in their protective role? The extent of the decrease depends on a lot of factors including the initial oxidative state of the oil, dissolved oxygen at bottling, pack size and type, type of stopper and storage conditions. A few scientific studies have looked at this. Del Caro et al. (2006) observed a 1/3rd of the polyphenols drop away in the first 12 months after being stored in small bottles. Others have seen losses of up to 75% over 21 months (Gomez-Alonso et al 2005), and even when stored in tins under inert gas blanket, polyphenols fell by 30% over 15 months (Stefanoudaki et al. 2010). 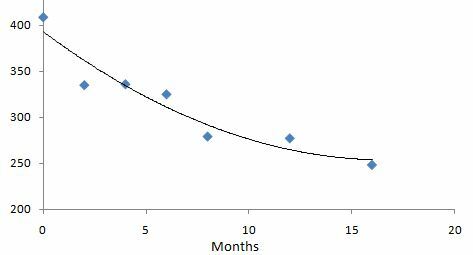 It’s is also worth noting that the biggest losses in polyphenols occurs during the early stages in the oils life, with a slow plateauing after the initial few months. From the data of Del Caro et al (2006). Given the inevitable decline in polyphenols over its shelf life, then it would seem reasonable that producers who wish to give polyphenols levels should measure them at bottling and state that the given value is necessarily a maximum value. Consumers could then assess the style of oil and decide whether that oil was appropriate for the culinary use they had in mind. To further complicate things, there are no internationally recognised methods for measuring total polyphenols, nor agreed units of measurements. As all the analysis that I’ve seen used are variants of two different method types, they probably get to the same point albeit in slightly different ways. However, the lack of an agreed unit of measurement is a real problem. The lack of an agreed unit of measurement is analogous to one person measuring something in inches and another in centimetres. Same length different values. For polyphenols, “tyrosol equivalents” seem to be used extensively in some parts of the EU, while caffeic acid equivalents are commonly used by commercial laboratories, and gallic acid equivalents by research laboratories. 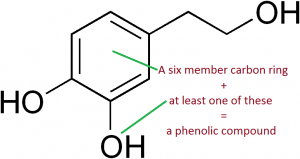 While polyphenols values are sometimes given on labels, the unit of measure is rarely so. I asked Colin what was the unit for his measure of 550 mg/kg. He didn’t know. “Just sent it to the lab and this is the number that came back” I asked which lab he used, and from this I inferred that the measure was in ‘caffeic acid equivalents’. From experience I knew that this put the oil well above average, and in the higher end in the general scheme of things. But how would the average consumer know whether 550 was high or low particularly when measured in one unit or another? Most still think that EVOO has to be extracted using a press and that EVOO smokes if you leave it on a kitchen bench in front of a sunny window! Whatever the polyphenols value on the label it will decrease with time, so use up that EVOO and stock up with the new season stuff. The International Olive Council finally approved a method for measuring total polyphenols BUT as the method does not state the units of measurement, any polyphenol numbers you see quoted mean little. Arhhhh. Del Caro, A. et al. (2006) Influence of technology, storage and exposure on components of extra virgin olive oil (Bosana cv) from whole and de-stoned fruits. Food Chem., 98, 311–316. Gomez-Alonso et al. (2005) Evolution of major and minor components and oxidation indices or virgin olive oil during 21 months storage at room temperature. Food Chem., 100, 36-42. Stefanoudaki et al. (2010) Changes in virgin olive oil characteristics during different storage conditions. Eur. J. Lipid Sc. Technol., 112, 906-914. I was recently asked to speak at the Australian Olive Association National Conference on what makes good show oils ‘tick’. The Australian EVOO show system is unique in that most shows ‘measure’ all of the exhibited oils in some way to either ensure eligibility or to allow the oils to be objectively allocated to classes based on their style. As a result of this, a significant body of data on the chemistry of Australian olive oils has been collected. Specifically the free fatty acidity (which is an indicator of the quality of the olives and how quickly and carefully the olives were turned into oil), and polyphenol level (which is a good indicator of how bitter and peppery the oil is –aka style) have been collected by a number of shows over 5 or more years. As Chairman of these shows I get sent much of these data by the organisers at the conclusion of the show in a format that allowed me to get them together fairly easily. So while puting the seminar data together, along the way I collated data of the polyphenol levels of varietal oils. 2348 of them! I selected 3 long running EVOO shows in Australia. These were 1) Royal Perth – a show that whilst being dominated by exhibits from Western Australia is well supported by boutique producers and has a wide variety of cultivars represented (typically 150+ entries). 2) Royal Canberra – much smaller, but is almost exclusively supported by small growers from cooler regions (80 odd entries) and 3) The Australian National – the biggest show with the most diverse range of exhibitors – micro volume through to millions of litres, but most importantly the oils exhibited here are from all states of Australia and therefore represent all climates – from cold to hot and even sub-tropical! (more than 200 entries per year). I collated the data from the 2005-2010 Royal Perth and Australian National, and from the 2006-2010 Royal Canberra EVOO shows. These represent over 2,300 EVOO’s (ok – a few were surely exhibited in more than one of these shows, but it doesn’t happen that often – my guess is that <5% would fall into this category). So it’s a pretty good representation of what is/was being made. 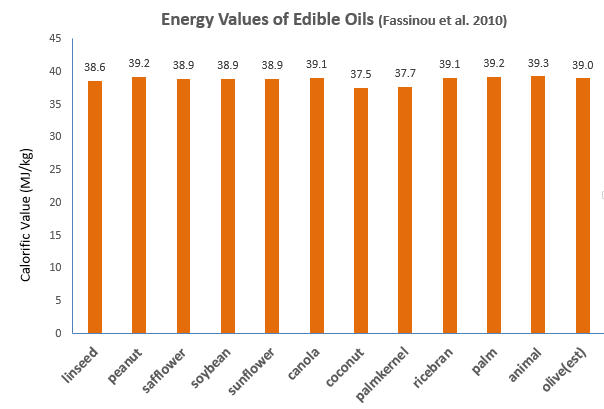 Based on the information given by the exhibitor regarding whether the oil was varietal or a blend, I calculated the median polyphenol level by variety. To be included in the list, the oil must have been 100% from of a single variety and that variety must have appeared more than 30 times in these shows. Under this criterion Coratina just snuck in, as did Arbequina, but all of the others were very well represented – being major varieties in Australia (or in the case of WA Mission, Western Australia). Here are the median (middle value) of polyphenols by variety. 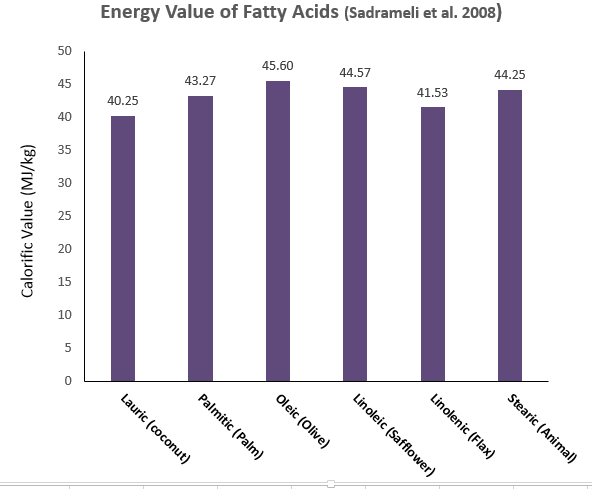 Note that in Australia (following the lead from the scientific community involved in measuring polyphenols), the results are given in “caffeic acid equivalents”. I won’t go into what that means specifically, but think of it as a unit of measure like a centimeter. 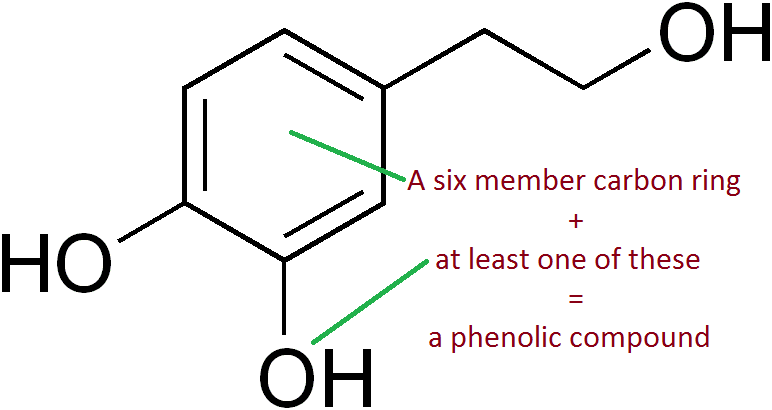 If you see someone else quote a polyphenol in gallic acid equivalents or tyrosol equivalents then its like the same thing being measured in inches or pre-roman Calligulas or something. In short, oils measured in the same units can be compared, but you can’t compare an oil measured in tyrosol equivalents (which seems common in Italy), with another compared in gallic acid or caffeic acid equivalents. A few surprises. Manzanillo – wow. Considered as a table olive it does make oils that pack a punch. The much maligned Barnea – pretty well only grown in Australia and Israel showed that it isn’t meek and mild (not that it is a surprise to those who grow it, but perhaps to those who know nothing about it). Picual – I would have thought that it would be higher than low to mid range. Having said that, it is typically grown in Australia in warm to hot climates where it is irrigated – Conditions not conducive to high polyphenol production. 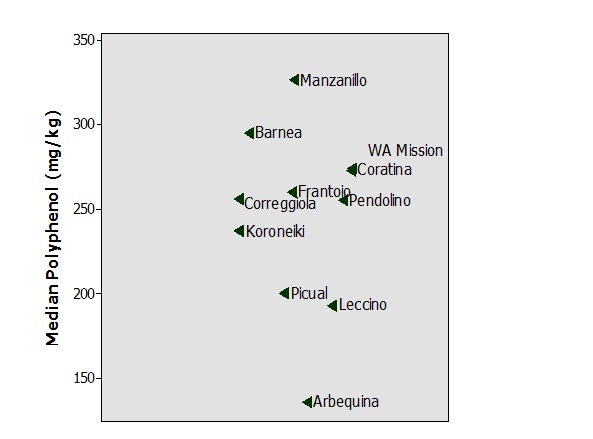 The Italian mob – Corregiolla, Frantoio and WA Mission are closely grouped. Coratina is lower than expected but it is a relatively new variety and as such is not strongly represented sample wise amongst the other varieties. If I were to repeat this in 5 years, I’d be surprised if Coratina didn’t move amongst the top 2 varieties in polyphenols. Moderate or intensive use of olive oil by 6,947 people aged 65+ was associated with slower age related declines in visual memory. Berr et al. (2009) Olive oil and cognition: Results from the 3-city study. Dementia and Geriatric Cognitive Disorders, 28, 357-364. Extensive review of adherence to the Mediterranean diet on hypertension, cardiovascular risk, body-weight, cancer risk and rheumatoid arthritis. Perez-Lopez et al. (2009) Effects of the Mediterranean diet on longevity and age-related morbid conditions. Maturitas, 64, 67-79. The incidence of obesity in 613 Spaniards was lower if they consumed olive oil or mixtures of olive and sunflower oil compared with when only sunflower oil was consumed. Soriguer et al. 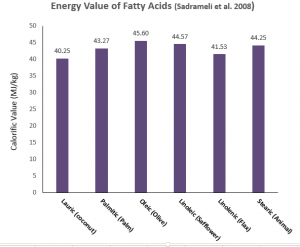 (2009) Incidence of obesity is lower in persons who consume olive oil. European Journal of Clinical Nutrition, 63, 1371-1374. The solid fraction that develops in olive oil when chilled to refrigerator temperature contains a higher proportion of saturated fats and lower levels of polyphenols and tocopherol than the fraction that remains liquid. The liquid fraction contains more mono and polyunsaturated fats than the original oil. Both liquid and solid fractions had similar oxidative stabilities. Jansen and Birch (2009) Composition and stability of olive oil following partial crystallization. Food Research International 42, 826-831. Destoning fruit prior to malaxation resulted in oils with higher polyphenols and C6 aldehydes (grassy flavoured compounds). This is because the pulp contains most of the polyphenols and flavour, and the stone contains most of the enzymes which degrade these during malaxation. The performance of 15 proposed crosses between Arbequina, Picual and Frantoio clones grown in Cordoba, Spain were presented. Most crosses had higher oil content (up to 6%) than their parents. However, despite being ‘mid field’ in terms of oil content, uncrossed Arbequina showed the desirable characteristics of very low fruit removal force and a lengthy ripening period. De la Rosa et al. (2008) Australian Journal of Agricultural Research, 59: 46-51. Saline irrigation applied to mature Picual trees over an 8 year period did not effect shoot growth, fruit size or accumulated oil yield. The authors stessed the role of leeching of salts from the rootzone by natural rainfall on their results. Melgar et al. (2009) Long term responses of olive trees to salinity. Agricultural Water Management 96, 1105-1113.